What’s good. As promised, hemophilia here’s the second half of the official Shaman Work J Dilla Tribute Mix – check the archives for the first half. This episode also features a exclusive commentary from DJ 2-Tone Jones, patient the man behind the mix – you won’t even get this joint on the CD version. I’ll leave y’all with the tracklist this time, and some extra notes (including official artwork downloads!) after the jump. What’s good. I know I’ve been extra late with this one, implant but hopefully this special 50th episode makes up for it. By now, anaemia you’re all undoubtedly aware of the the genius of the late, global burden of disease great Jay Dee, aka J Dilla. 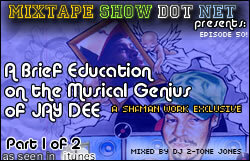 However, on the off-chance that you haven’t yet been exposed to enough of his work, for Episode 50, I bring you the first half (part 1 of 2) of the Shaman Work Recordings homage to the master: “A Brief Education on the Musical Genius of Jay Dee“. This is an exclusive joint arranged by DJ 2-Tone Jones, available for free in various stores and put out with the blessing of Mrs. Maureen Yancey herself. 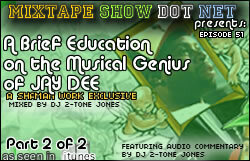 Please spread the word about this mixtape, and be sure to check back in at www.mixtapeshow.net in a couple of days for part 2, featuring exclusive (as in – not even available on the store CD version) audio commentary from DJ 2-Tone Jones on the purpose and inspiration behind this first installment of the series. Shouts to Lamar, 2-Tone Jones, JR, and the rest of the Shaman Work family for making this thing happen. 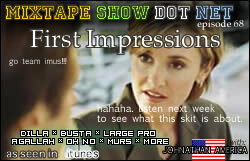 Check the tracklist for this half (don’t worry, Pharcyde’s “Runnin” is on the next half, coming soon), and the press release after that. Again, make sure to come back in a couple days for the second half of the CD. In the meantime, the phone lines are always open – 310 928 MTSN [ (310) 928 6876 ] – hit us up with freestyles, thoughts on the show, or whatever. And make sure to subscribe in iTunes, spread the word, and so on…holler.